I wanted to share something that Princess of the Universe is getting for Christmas, and it was a GREAT deal! 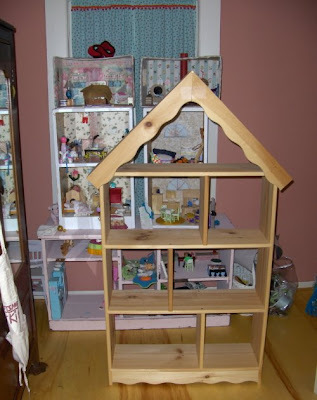 I have long noticed this dollhouse/bookshelf in A.C. Moore, but for 99 dollars I never really spent that much time looking closely at it. Until yesterday. Princess of the Universe is at Grandma's and Grandpa's for a few days, which means easier shopping for me! I had one of those 50% off any regularly priced item from A.C. Moore. I actually printed mine from on line by searching Google and finding a current coupon, but the Sunday paper usually has one as well. I inquired about using the coupon before I had them pull this big item from the upper shelf it was on. Yes, they said they would take the coupon - as long as the item was regularly priced, and it was! Yippeee!! I called my husband and he said he could easily cut a piece of pretty white beadboard-type wood to fill in the back of the shelf so the rooms will look finished! For 50 dollars, I bought it. Oh boy, will the doll house adventures continue this year! !